Online scheduling is now active by research group login. Visit this website, then enter ULNMR as the Group and your research advisor's name for the User. The Department of Chemistry's nuclear magnetic resonance (NMR) facility currently consists of a new state-of-the-art 3 channel Unity Inova 500 MHz spectrometer complete with pulse field gradient capability, along with a 2-channel Varian Inova 500 MHz system dedicated for multinuclear NMR. The department was recently awarded federal funds for the purchase of two new Varian spectrometers: a 400MR system complete with robotic sample changer, and a high field 700 MHz NMR and cyroprobe, truely pushing the NMR facility into the forefront of NMR research in the 21st century. Offline processing capabilities exist on several different computers and processing programs and will be tied in with the newly created departmental computing facility. The facility is maintained by Dr. Neal Stolowich and welcomes collaborations from within the University community as well as industrial partners in the Louisville area. For more information, look for our upcoming NMR home page or email Dr. Stolowich. Also, see the installation of the Varian 400MR NMR Spectrometer. 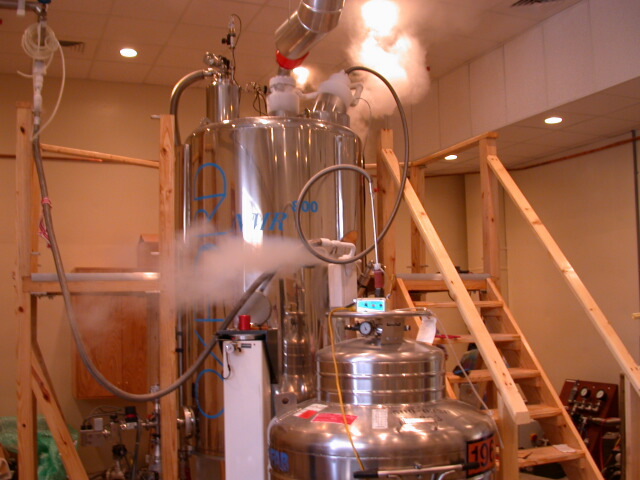 An NMR spectrometer operating at 18.8T (800 MHz for protons) was funded through a $2.3M NSF/EPSCoR grant (P.I. Professor Richard Wittebort) and was installed in 2003 in the Molecular Imaging Research Center at the Brown Cancer Center. This system is used for the study of larger proteins and complexes using the TROSY technique. It is also equipped for solid-state (CP-MAS) NMR including a 32 mm HCN MAS probe.